SEOUL, Sept. 15 (Yonhap) -- About 200 violent crimes, including murders, end up unaccounted for every year, with assailants going unpunished because those untallied crimes, criminologically called the "dark figure of crime," lack critical information to build a formal case, such as the identities of the criminal or victim or even the very occurrence of the offense. "Dark Figure of Crime" is a rare film that delves into the subject new to the local cinematic scene. It was inspired by the true story of a murderer who confessed his other unpunished murders to a police detective. 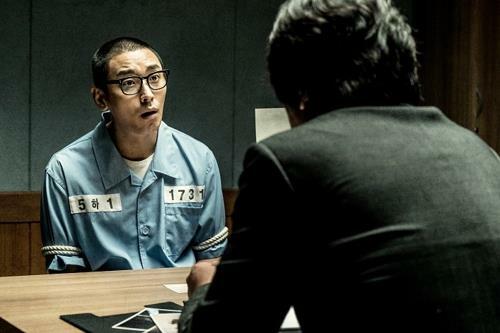 Naturally, a majority of the scenes in "Dark Figure of Crime" take place in a prison visiting room, where the detective Kim Hyung-min, portrayed by Kim Yoon-seok, goads, coaxes and even bribes Kang Tae-oh, played by Ju Ji-hoon, to provide more clues in his confession. Like the real convict, Tae-oh deliberately misleads Hyung-min with scant clues about his crimes in a game like twenty questions, deploying a strategy of impeding the processing of his original murder case and eventually overturning his conviction. Suspense builds up between the two as Hyung-min closely parses the clues given by Tae-oh, who makes them convincing enough to keep Hyung-min's investigation afloat but not too specific to ensnare himself. The fierce interplay between the two main characters, portrayed by two rounded actors arguably both in the prime of their acting careers, forms the film's core, setting it apart from other crime films that play with cathartic action scenes or steel-strong images of police detectives. However flimsy or confusing the hints, the tenacious, business suit-clad Hyung-min sticks to the clues given in his efforts to put a human face on the undeclared murder victims, displaying the vision necessary to lock up the serial killer in his cell for good. The police detective in the actual murder case, which became the basis for the film, continues his unfinished search for the identities of the convict's murder victims, while the convict killed himself while serving the 15-year prison term he got in his initial murder case, according to the film's ending credits. Director Kim Tae-kyun, who also wrote the story, said he was inspired by the real-life detective's passion and conviction. "I wanted to portray an image of a guardian (of society). I felt so reassured by the defective who turned his eye to the victims' human faces as a mother, daughter or son of somebody, rather than as (figures) in documentary evidence," the director said in a news conference on Thursday. "One person who sticks to his or her duty makes a difference ... and those untallied murders are the result of indifference and irresponsibility," he said, expressing hope that his film could bring change for society. The new film, Kim's third major production, is in keeping with his two previous movies' focus on the less-explored sides of society's minority groups. His 2011 film "Spring, Snow," portrayed a terminally ill mother facing her death, while the 2014 release "Twinkle Twinkle Pitter Patter" dealt with a friendship between a blind little girl and a hearing-impaired woman. For big-name actor Kim Yoon-seok, it is one of the many police detective roles he has taken so far. "I have done multiple detective roles, but the role of Kim Hyung-min I played in this film is the most desirable one," he said in the press conference. "It may be the most important quality for a police defective to start from the perspective of a victim, rather than that of the criminal." For the 36-year-old Ju, it is his third movie release of 2018 and his most career-changing role. "(Tae-oh) is the epitome of evil men. He has no sense of humanity or justice. He works only for his own interests," Ju said. "It put me under a lot of pressure to portray a character who engages in a brain game with a police detective while already serving a prison sentence," he said. The film, distributed by Showbox, will go onscreen at major movie theaters on Oct. 3.